päpstliche Architekten. Autograph document signed. [Rom]. 1 S. 4to (280:205 mm). 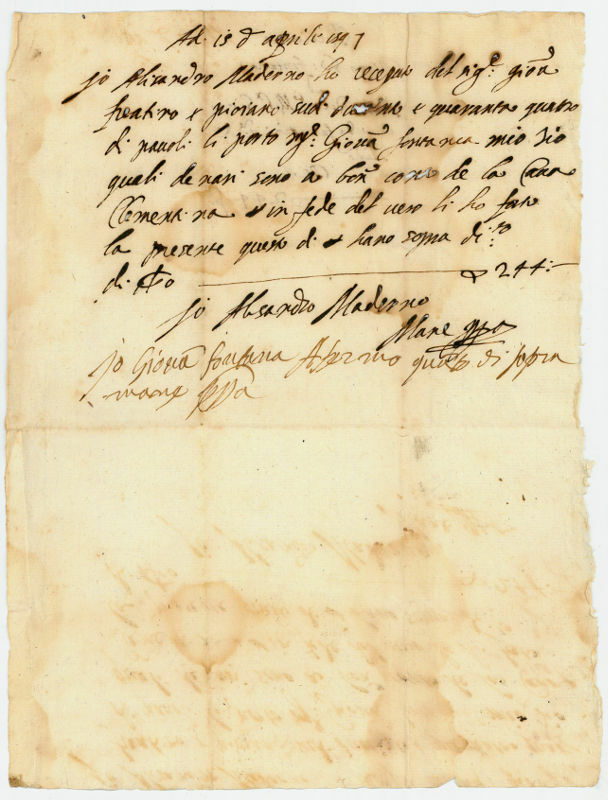 Maderno confirms having received from Giovanni Reatino the sum of 244 scudi, which he has given his uncle Giovanni Fontana toward the building of the Cava Clementina ("a bon conto de la Cava Clementina"). 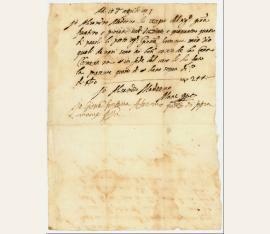 The receipt is counter-signed by Fontana himself ("io Giovanni Fontana approvo quanto di sopra"). - The "Cava Clementina" was a project to canalize the river Velino near Reate, commissioned by Pope Clement VIII between 1596 and 1602 and undertaken by Maderno and Fontana. - Giovanni Fontana was the elder brother of the architect Domenico Fontana (1543-1607), Alessandro Maderno was their nephew and the brother of the architect Carlo Maderno (1556-1629) and the sculptor Stefano Maderno, as well as the uncle of the architect Francesco Borromini. Apart from Gian Lorenzo Bernini, the Fontana-Maderno-Borromini family of architects, originally hailing from Ticino, were the most important builders of Baroque Rome. They not only worked on St. Peter's Basilica, but also on many other Roman churches and palaces, and their works have shaped the face of the Eternal City. Fontana, known as one of the leading hydraulics engineers of his age, was responsible for a great number of Roman wells and Papal projects in water engineering (river regulation, aqueducts, irrigation of the Vatican gardens). - Creased, with traces of folds; some stains; occasional ink corrosion..